Enraged by Norman Osborn's rise to power and his subsequent feigning legitimacy, this new Zodiac emerged from the shadows to wage war against heroes AND villains pretending to be heroes. Zodiac's plan was simple, distract Osborn and his forces while secretly stealing the Zodiac Key, a powerful weapon. Zodiac first tortured and killed over one hundred H.A.M.M.E.R. agents and then nearly killed Fantastic Four member Johnny Storm. It was at this point that H.A.M.M.E.R. agent Al Murphy brought these recent events to Norman's attention. Soon after, the Zodiac struck again, this time bombing a hospital and then triggering H.A.M.M.E.R. 's planetary defense network signaling the arrival of the planet-eating villain Galactus. Norman would soon realize that the attack was a hoax and that H.A.M.M.E.R. had been falsely alerted. Zodiac, however, did unleash a giant robot in Times Square that created a great amount of mayhem, the robot was pilotless so Norman had no leads on the perpetrator. In this particular instance, it appears as if Zodiac got the best of Norman. Here's Norman rallying the troops for the supposed Galactus attack. None really. The Zodiac and his crew were able to effectively distract Osborn and H.A.M.M.E.R. 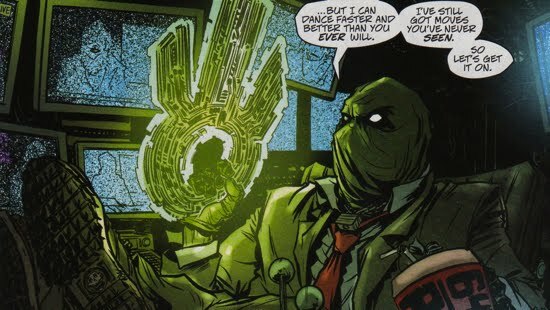 Osborn went on a PR campaign at the story's conclusion to deny that H.A.M.M.E.R. 's security systems were compromised and Zodiac went back into hiding, waiting with the Zodiac Key to continue his war. He was not seen again during Norman's reign. Here's Zodiac at the conclusion of the story, along with the Zodiac Key. 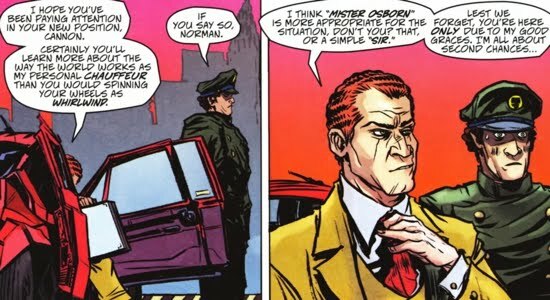 Back when Norman was running the Thunderbolts, the B-List villain Whirlwind tried to coerce Mac Gargan (aka Venom II) into blackmailing Osborn (as seen in Thunderbolts: Reason in Madness). Gargan didn't take the bait, strengthening his relationship with Norman and allowing Norman to exact vengeance on Whirlwind and his cohorts. Well, the phrase 'keep your friends close and your enemies closer' had a new meaning when Norman hired Whirlwind (aka Dave Cannon) to be his chauffeur! 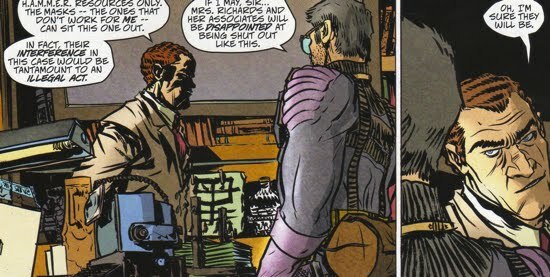 Cannon may have gotten the last laugh on Norman though, because the villain was a mole working for Zodiac, helping him to infiltrate H.A.M.M.E.R. 's security systems. Here's Norman fighting Whirlwind back with the Thunderbolts. And just for good measure, here's Norman showing his feelings toward the Fantastic Four's involvement in the Zodiac case, remember that Johnny Storm was injured because of the Zodiac.